August has roared in with the welcome return of some northwesterly winds and it’s marvelous! What we generally think of as the prevailing summer winds have been strangely absent this year. Weeks of southerlies – swinging from southeast to southwest – have made for nice gentle seas and easy access to the expansive fishing grounds. 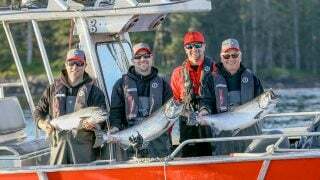 But northwest winds serve to drive the bait to the northern shores of Haida Gwaii and into our home waters of Virago Sound in particular. And we all know that where there’s bait… there’s great fishing! Of course we won’t sneeze at the gorgeous sunshine and warm temperatures that are mighty uplifting for all of the staff around the lodge as well! As a result we’re quite happy to report that the fishing has turned on quite nicely this week. Chinook action has moved back onshore and QCL anglers are finding lots of nice chunky salmon in all the traditional haunts – Bird 2 has seen some nice hot bites in recent days, the waters from Cape Naden to Bird 1 have produced some Tyee action and the kelp beds in front of Yatze bay are providing pretty steady results, especially on the flood tides. Derald W boated a stunning big Tyee while fishing with veteran QCL guide Ryan Winger on Tuesday. He always tries to release his big fish but unfortunately this one couldn’t be revived and at the Bell Ringer it tipped the scale at 42 pounds. We also saw several nice Tyees in the 30-plus range on the board this past week. 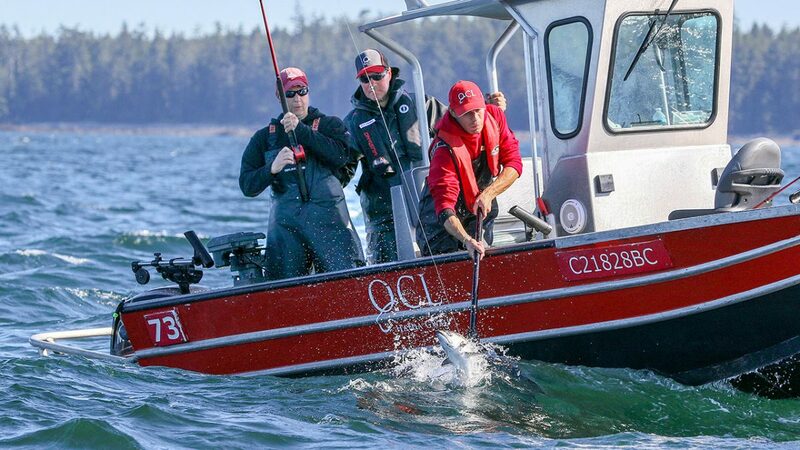 We’ve been trolling up Coho all over the offshore waters recently but are now seeing decent numbers showing up closer to shore. The average size is still 7-9 pounds but we are getting some beauties over 10 pounds starting to appear, as we would expect for this point of the season. 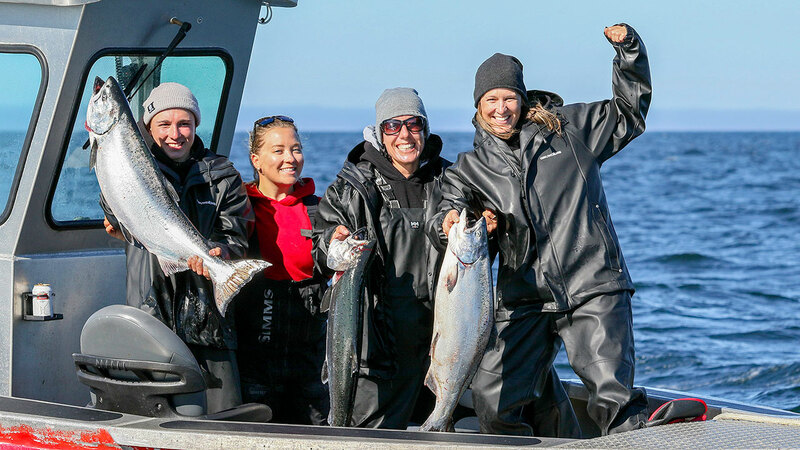 The halibut fishing continues to be a nice reliable part of the experience and lodge guests have been happily picking up some nice “chickens” for the fish box while releasing a number of big females over 60 pounds. Andre C released a giant that taped out to just over 100 lb., Eric S. reeled up a 134 and Haydn S. got a serious workout pulling up an 82 pounder followed by a bigger one that taped out to 123! Lots of great fish stories go along with these catches to be sure. 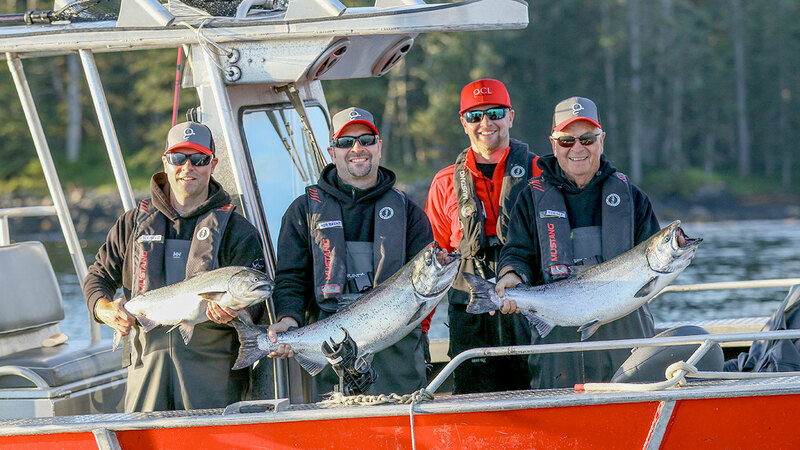 Looking ahead, the northwesterlies are forecast to continue right through next week so we’ll keep the sunscreen on the table and be ready in the Bell Ringer to celebrate many more great catches! Stay tuned! 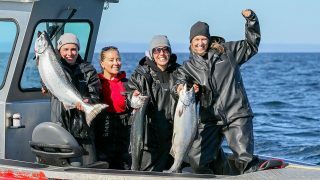 previousQCL Halibut Record is Broken Again!